Clean, peel, cut and cook the sweet potatoes in water for 15 minutes at medium heat with the lid on. When they're ready, remove from the heat and pour out the water. 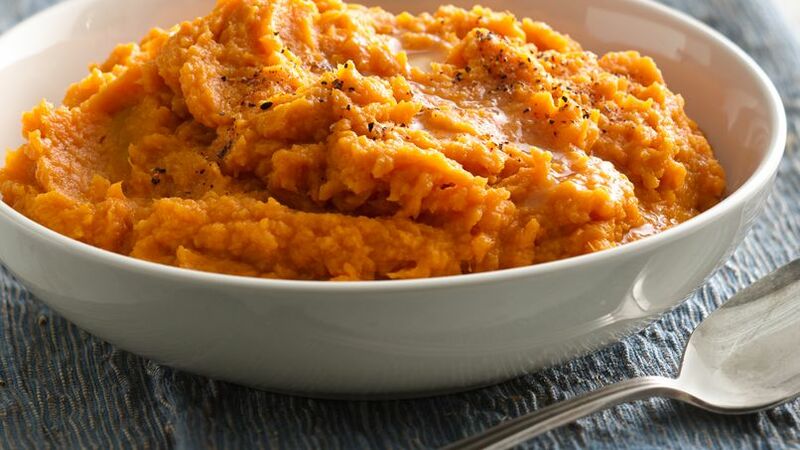 Use a masher to mash the sweet potatoes until you have a purée, add the seasoning and butter and stir well. Serve immediately. This recipe is a perfect side for turkey, pork or chicken. If you have leftovers you can use it in a soup, just add vegetable or chicken broth. My Cuban family loves the traditional flavors I prepare for Thanksgiving. You can always find yummy sweet potatoes on our Thanksgiving table because they go so well with pork or turkey. Normally, sweet potatoes are served sweet with cinnamon, butter and marshmallows. However, today I want to prepare them as a savory option so I can add the traditional seasoning we love so much. I invite you to try this delicious Thanksgiving recipe this year.